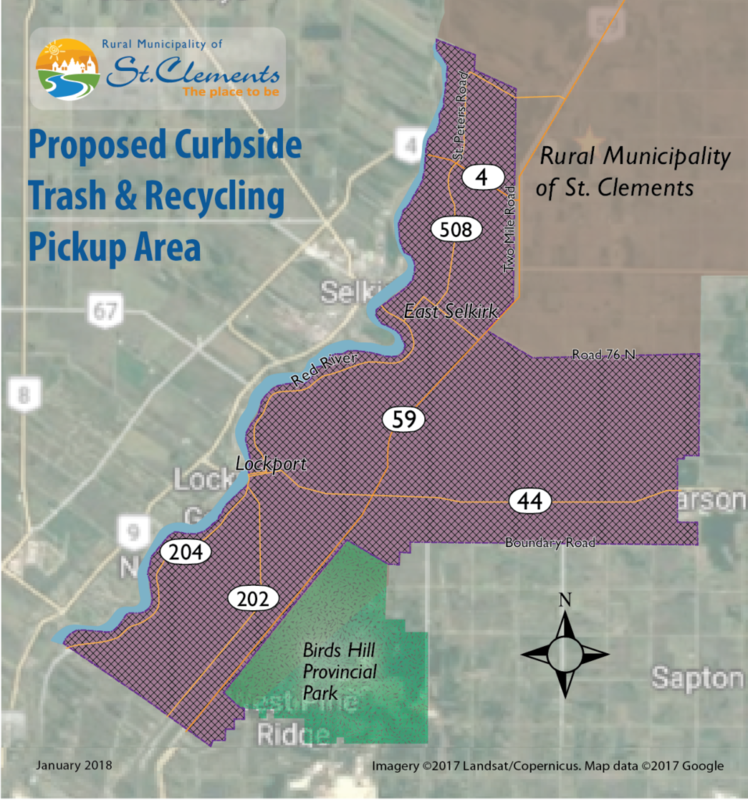 Residents in southern St. Clements might be enjoying curbside waste and recycling pickup as soon as this summer for their convenience and to help increase recycling rates in the RM. Council took the steps to make this a reality on Tuesday, March 27, 2018 when they gave the curbside pickup by-law and service plan first reading. The provincial Municipal Board will now review these and determine whether to approve the plan, approve with amendments, call a public hearing, or deny. As is legislated, the Municipal Board has the final say on whether the curbside pickup plan proceeds. A Municipal Board decision is expected in time for the service to begin July 1, 2018. How did public feedback affect the curbside pickup service plan? The RM has done an unprecedented amount of public consultation on this project and this input has had a significant impact on the final service plan. “We are thankful for the thoughtful input of our interested and engaged residents as it helped us to come up with a plan that is suitable to the most people,” said Mayor Debbie Fiebelkorn. The original plan was that curbside pickup service would be mandatory for all of the 2790 occupied residences in the service area. But because of strong public feedback requesting to have a choice to opt out of service, Council decided to investigate and see if this was feasible. Residents who wanted to opt out of service were asked to register via a paper or online survey. 1098 residents chose to opt out, which leaves 1692 residences in the service area. Council took these new numbers to the proposed curbside pickup contractor, and the contractor said they would still be able to maintain their original bid per household of $105 plus up to 2% per year for five years. Curbside pickup service was still feasible and Council decided to proceed. The idea of implementing curbside pickup came out of the review of the RM’s solid waste management practices that was done as part of the 2015-2018 Strategic Plan. 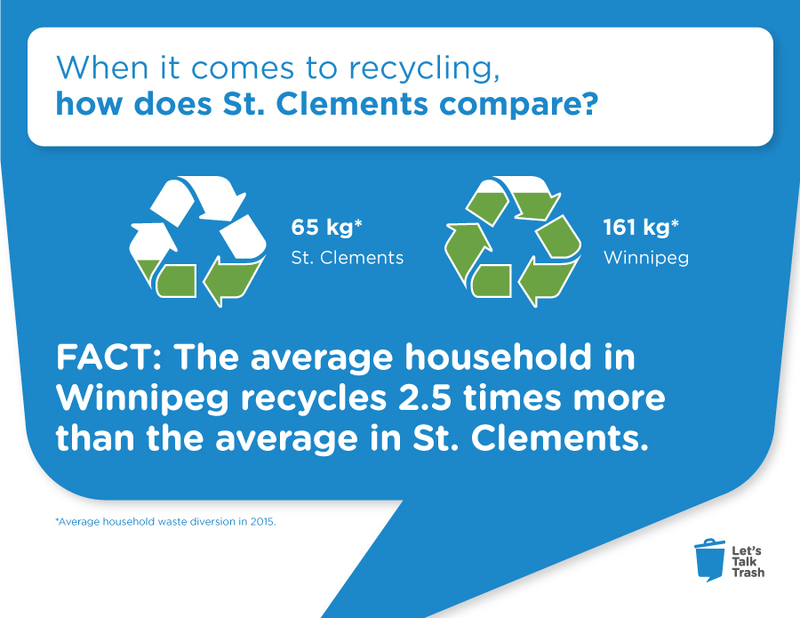 The RM of St. Clements currently has one of the lowest recycling rates in Manitoba but some of the highest costs for waste management. A survey of all residents in the fall of 2016 showed about 70% of the 470 respondents were interested in curbside pickup in the more densely populated areas of the south. A later survey showed that the majority of respondents in the service area wanted automated curbside pickup service for waste and recycling. Curbside recycling pickup service has been shown to increase recycling rates by 30% to 50%. Here is the content of the letter sent on February 22, 2018 to all residents in the curbside pickup area regarding the possibility of opting out of curbside pickup. The RM has proposed a curbside waste and recycling collection program in your neighbourhood (details and a map are available on our website at rmofstclements.com/trash). The cost is $105 per year plus up to 2% per year for a five-year period to be added to residents’ annual property tax bill and includes a 240 litre (64 gallon) waste cart and a 360 litre (95 gallon) recycling cart. Of the 2600 homes in the proposed curbside pickup service area, we know of 244 homeowners that are opposed and would like the option to opt out. Because of this public feedback, the RM is taking this step to explore the feasibility of allowing individual homeowners to opt out. If you would like to opt out of service, please fill out our online form at rmofstclements.com/optout OR fill out the form on the reverse and return it to the RM Office by Friday, March 9, 2018. Based on the number of residents who choose to opt out, Council will determine whether opting out is economically feasible. If opting out is feasible, those who opt out will not be charged an annual fee on their property taxes and will not receive waste and recycling carts. Residents who opt out will be able to opt in later, but those who are already opted in cannot opt out. The idea of implementing curbside pickup came out of our waste management study, which discovered that the RM of St. Clements has one of the lowest recycling rates in the province and some of the highest waste management costs. Curbside pickup was recommended as a way to address both of these issues. A survey of all residents in the fall of 2016 showed about 70% of residents were interested in curbside pickup in the more densely populated areas of the south, so Council decided to investigate curbside pickup further. After determining where the service area would be and the cost for service, the RM did an online survey for residents in the proposed service area about which type of service they would prefer, if any, and received 565 responses. For a population of 2600, this response is considered 95% accurate plus or minus 4%. Regular public consultation along the way has helped shape this plan and we thank all those who have shared their concerns and ideas. Contact us at info@rmofstclements.com or 204-482-3300 if you have any questions. A Public Hearing on Curbside Pickup was held on Monday, January 29, 2018 at 7:00 pm at the East Selkirk Hall in East, Selkirk, Manitoba. 226 people attended with 148 opposed to curbside pickup, 47 in favour, and 30 undecided. At the meeting, Mayor Debbie Feibelkorn addressed the group and CAO DJ Sigmundson gave an overview of the proposal and addressed concerns raised by objectors. A Curbside Pickup Fact Sheet was distributed (view below* or download here). Residents were then allowed to speak. 33 residents chose to speak with 24 opposing curbside pickup and 9 supporting it. The main reasons for opposition were long driveways, added expense, safety concerns, physical inability to move carts, not trusting that the cost won’t rise, wanting to be able to opt out. Many people opposing curbside were very environmentally concerned and strong recyclers and would like the RM to install 24-hour-a-day-access recycling, much like what the RM of St. Andrews has at the Donald Road Fire Station and Harry’s Foods. Mapping: We mapped the location of homes of the 244 residents opposing curbside pickup that we know of through the Public Hearing, letters of objection and two petitions, one online and one local. We are working with this map and the proposed contractor to see if there is a possibility to allow residents to opt out of curbside pickup without raising the proposed base cost of $105/year. When council has that information, they will determine whether to proceed with curbside pickup. The RM is proposing to implement curbside trash and recycling pickup in the southern part of the RM due to strong public demand. Some people have concerns over this proposed service. Thanks to all the residents who shared their concerns as it has helped us more fully develop some of the details of this proposal. Because of escalating costs, transfer station fees are one-third lower than they need to be to cover costs. That mean everyone is subsidizing trash at the transfer stations. Private pickup in St. Clements does not include recycling so many people throw their recycling away. Burning is not only illegal but today’s garbage releases toxins that harm health. The cost for curbside pickup works out to between $2.01 – $2.23 per week (about the same as a large coffee from Tim Hortons) over the 5-year period of the service contract and includes two high quality carts valued at $125 each. Many people don’t consider the cost of driving to the transfer station/landfill. We created an example to calculate the cost of gas pretending we are driving from the RM office to the nearest transfer station, which is Clarke Road, once a week with one bag of garbage in a 2013 Honda Civic. This doesn’t include wear and tear on your vehicle and other vehicle-related costs. Because of the demand for the opportunity to opt out of service, the RM is exploring if it is possible to offer an opt out option at an efficient price. We have contacted other RMs that also have homes with long driveways to see how they have handled this. None of them receive concerns about long driveways and they said these concerns fall away after service has been operating a few months. Other RMs also have a special service option available for people who are physically unable to move their carts. In some cases, residents store the carts near the end of their driveway and use their vehicles to transport garbage and recycling to the carts. Hitch attachments to transport the carts are available online and someone in East St. Paul also designed one when curbside pickup was implemented there. Upon hearing this concern we investigated what other RMs do in this situation. Some offer a free ‘set back’ service for residents with a doctor’s note so they don’t have to take their carts to the curb. We can consider this service. Wind: On very windy days, carts do blow over but it is an occasional problem at other RMs. No shoulders: The carts do not require a lot of space to be set out, because the base of the carts is only a little larger than one square foot. The RM and contractor anticipate that the shoulders in most areas should be sufficient to accommodate the carts. We have many residents who are very environmentally-responsible with their waste; they recycle and compost everything they can and thus have very little trash. 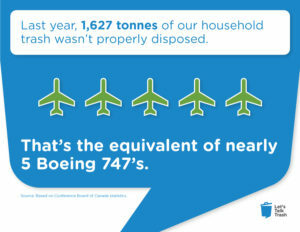 Unfortunately, there are many who do not recycle or compost at all and much of this ends up in the landfill. Organic waste in the landfill creates methane gas which is a greenhouse gas that is 86 times more potent than carbon dioxide. Recycling put in the landfill wastes resources and fills the landfill cell quicker. Cells are very expensive to build and that cost is paid for by all taxpayers. The RM also gets paid for recycling and must pay a fee for all garbage disposed of in the landfill. Curbside pickup of recycling has been shown to increase recycling rates by 30%-50%. Recycling carts are purposely bigger than the trash carts to encourage recycling. The carts have lids and typically this reduces the attraction of wildlife and litter compared to ordinary garbage bags and open top bins. This is part of having curbside pickup. Fortunately it is only one day per week. The majority of residents do want this service and 9 out of 12 municipalities around Winnipeg have curbside pickup service including West St. Paul, East St. Paul, Ritchot, Macdonald, Springfield, Tache, Rockwood, Hanover. The 360 litre (95 gallon) recycling cart has been shown to be adequate for bi-weekly pickup in other municipalities. Bi-weekly pickup costs half of what weekly pickup would cost. It is true that transfer stations currently charge a low rate to residents at $1.25 per bag for the RM to transport trash and recycling. However, transportation and related costs have skyrocketed over the past several years and the real cost for each bag of garbage from Clarke Road and Dunning Road Transfer Stations is $4.50. At this time each bag is being subsidized by all taxpayers by $3.25. User pay is not covering the costs. This survey doesn’t represent the will of the people. Why didn’t you mail it out to everyone? There is a misunderstanding that the Service Options Survey is the final word in this process. This is not the case. The RM must follow a legislated process including a public hearing and approval from the Municipal Board before being allowed to implement curbside pickup. The electronic survey was a quick and economical way to reach a large proportion of people in the service area to get a general idea of the preferences of the people. The RM has consistently found that consulting with citizens helps us make better decisions that reflect what residents really want. The survey, analysis and promotion was all done in-house at a low cost. To mail it out to the entire service area would have cost at least $4000, with no guarantee of a better response. There are an estimated 2600 homes in the service area and we reached about 1000 people, using readily-available tools, through email, Facebook, our website, the RM readerboard, and two mobile signs. 565 people responded. This response is considered 95% statistically accurate plus or minus 4% for a population of 2600 people and in fact we would have only needed 488 responses to get this level of statistical accuracy. Curbside pickup is a proposal at this stage. The RM must follow a legislated process including a public hearing and approval from the Municipal Board before being allowed to implement curbside pickup. Why does the RM want to implement curbside pickup now? Costs of managing waste have escalated due to increased regulation, enforcement, transportation and other demands. The RM is charged a tax of $10 per tonne of garbage put in Libau Landfill. Waste Reduction and Recycling Support (WRARS) gives the RM a rebate based on weight of recyclables collected. Recycling converts our old products into new products which saves resources and helps reduce air and water pollution. In other words, it is good for the environment. 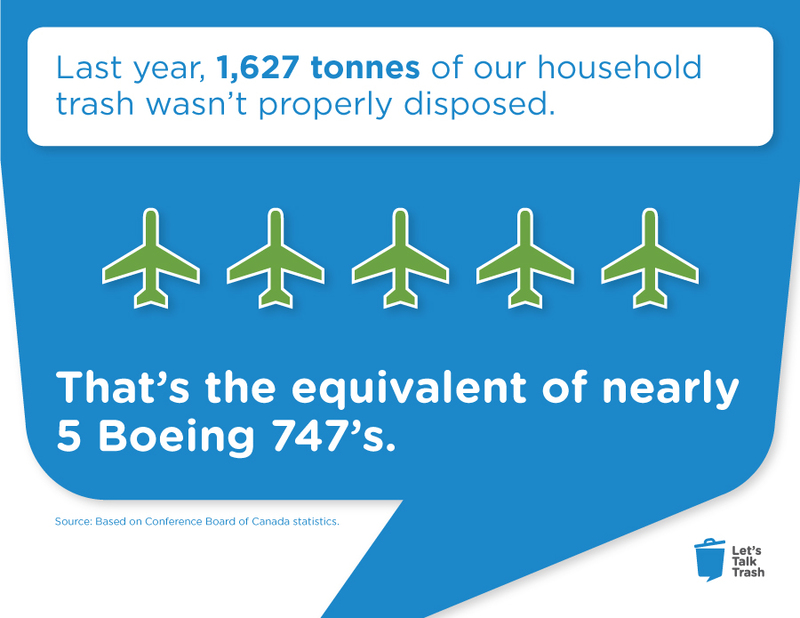 Keeping recyclable outs of the landfill means the landfill fills up more slowly. Creating new capacity for garbage at the landfill is very expensive and the RM (thus taxpayers) must pay for this. Why don’t you install 24-hour central recycling depots like they have in the RM of St. Andrews? The RM of St. Clements collects recycling as well as household trash, e-waste, used oil, tires, yard waste, car batteries and propane tanks at all four transfer stations and the Libau Landfill, but with limited access. The RM of St. Andrews has higher recycling rates (in 2015, 56.9 kg per person per year) than the RM of St. Clements (25 kg per person per year) but it is still well below the provincial average (73 kg per person per year). The system is inefficient because, unless bin contents are compacted, a lot of space is taken up by air; bins fill faster and you are paying to transport air. RMs are paid for recycling (by Manitoba Waste Reduction and Recycling Support) by weight, not volume. The cost of transport diminishes/eliminates income from recyclables. Because of continued interest expressed by residents in curbside waste and recycling pickup for the south end, the RM of St. Clements has decided to take the next step which is to create a Special Service Plan for curbside pickup; this does not mean curbside pickup is guaranteed to happen. In order to be able to implement curbside pickup and charge only the residents receiving the service, the RM must follow a legislative process outlined in the Municipal Act to ensure all affected residents are aware of the plan. The Special Service Plan for curbside pickup is the framework for what will become a by-law if Council decides to proceed with curbside pickup. The public may come and give support, share concerns or register objections. Written objections can be submitted anytime before the hearing until it closes. If you wish to voice your opinion, you must register at the meeting before it starts. An explanation and overview of the plan will be given. Residents will have an opportunity to speak – any questions will be noted at that time and addressed at the end of the meeting. Council/admin do not directly answer questions at this time. A summary of the meeting that addresses questions asked throughout will be given. Following the Public Hearing, Council will consider all public feedback and determine whether to go forward with the Special Service Plan as it is, with amendments, or not at all. If Council decides to proceed, the Special Service Plan is sent to the Municipal Board for approval. The Municipal Board will approve, make conditions, or reject the plan and may require a public hearing. 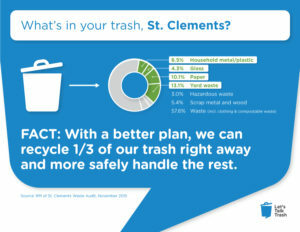 Throughout 2016, when the RM of St. Clements asked residents how they would like to increase recycling rates and improve solid waste service levels, there was a strong interest in having trash and recycling curbside pickup in the southern part of the RM. Based on this, the RM requested quotes for service from curbside pickup contractors. Tenders were sent out to curbside pickup contractors in October with a November 15, 2017 closing date. The RM chose the top options which were manual curbside pickup and automated curbside pickup. In December 2017, the RM of St. Clements created an online survey (with print copies available) for residents in the proposed service area about which service options they preferred. This short survey was promoted electronically on the RM website, via email to our mailing list of about 640 (collected by volunteer sign up for other projects in the area), and on Facebook. The survey reached about 900+ people of the 2600 in the service area. Many thanks to the 565 residents who took the time to respond. The survey asked two questions. We also collected addresses so we could map the responses. No particular area stood out with the majority of respondents not wanting curbside pickup; those who don’t want curbside pickup are spread throughout the service area. Read the Summary Report of Curbside Pickup Service Options Survey Responses, December 13, 2017. 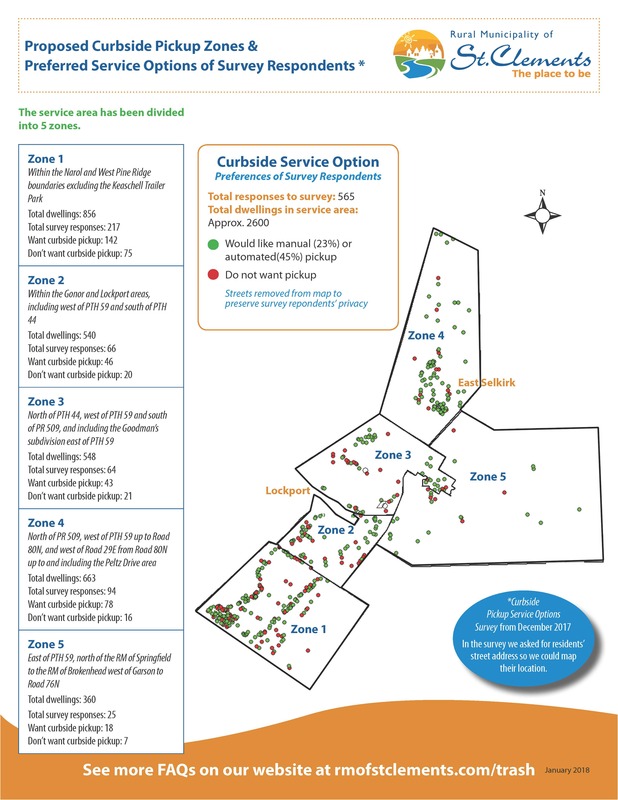 Below is a map showing the preferred service option of surveyed residents based on their address to give an idea of the distribution of how many residents want and don’t want curbside pickup service. What is the total cost to the RM for this service? The table below gives the estimated cost over the next five years. The cost is $105 per year for a five year term adjusted a maximum of 2% annually for inflation an an increase in homes. The cost for 2018 will be half the cost, or $52.50, because service will be for half a year. How did you determine this fee? The fee was determined by taking the curbside pickup contractor’s annual charge combined with the cost of the carts (spread over a ten year period) and dividing it by the number of occupied properties in the service area (see table below). How will I be charged for curbside pickup? Those receiving curbside pickup will have the amount added to their property tax bills every year. How much of my taxes now go toward garbage? In the RM of St. Clements, there is no user charge to residents for treating their everyday household waste. There is a fee at the transfer stations but this is the cost to transport the waste to Libau Landfill, not to treat the waste. Everyday household waste treatment is paid by all residents through their taxes. This cost is about $40 per household per year. When will curbside pickup begin? We are planning for curbside pickup to begin in July of 2018. I really don’t want curbside pickup. What can I do? If you don’t want curbside pickup, you can register your objection with the RM by sending a written letter to Chief Administrative Officer DJ Sigmundson stating your name, address, property description and the reasons for your objection. You can send this by email to cao@rmofstclements.com or by regular mail to the RM office at Box 2, Group 35, RR 1, East Selkirk, Manitoba, R0E 0M0. Objections must be submitted before the adjournment of the Public Hearing on Monday, January 29, 2018. All objections will be considered by Council while making the decision whether to go forward with the Special Service Plan for curbside waste and recycling pickup as it is, with amendments, or not at all. If you have registered an objection and after the Public Hearing Council decides to proceed with curbside pickup – which means they create a by-law for the Special Service Plan (as is or as amended) and give it first reading – you will be informed of this by regular mail and advised that you have a right to file a notice of objection with the Municipal Board. The Municipal Board will review the plan and decide whether to approve it, require amendments or reject the plan and may or may not decide to hold a public hearing. I have received a notice in the mail that my property is in the special service area but it is unoccupied. Do I still have to pay for this service? No, unoccupied properties, commercial businesses and multi-family dwellings will not be part of the Special Service Plan for curbside waste and recycling pickup. To remove your property from the curbside pickup service area list, fill out the Declaration of Unoccupied Property form on our website. What do residents in the RM of St. Clements do with their trash now? St. Clements operates a landfill near Libau and four transfer stations that process household and commercial garbage and recycling. From the survey we asked you about trash in October of 2016 (view survey results here) some take their garbage to the Libau Landfill or a transfer station, some get private curbside pickup, some take it outside of the municipality to their workplace or friend/family members’ homes, and some burn it (which is illegal). Are you going to close any transfer stations? There are no plans to close any transfer stations. With the waste tracking system we recently implemented, we will be able to closely track the use of transfer stations after implementing curbside pickup (if it proceeds) and measure the impact of curbside pickup. From that data, we can determine whether changes could be made to transfer stations to make them more efficient. Automated pickup uses special large capacity carts that are designed to be picked up by a robotic arm on the trash or recycling truck. The size and weight limits of carts are higher than for manual pickup because a machine is doing the lifting, not a human. Why does the RM want to start curbside trash and recycling pickup now? Waste Reduction and Recycling Support (WRARS) gives the RM a rebate based on amount of recyclables collected. What areas will be getting curbside pickup? The curbside pickup area is bordered on the west by the Red River, to the south by the southern boundary of the RM. From the southern border the area follows the eastern RM border northward until Road 76 N. Everything north of Road 76 and east of Hwy 59 is NOT in the area. On the west side of Hwy 59, the area extends northward from Hwy 212 up to the Peltz Drive area. Why are you not offering curbside pickup in Grand Marais and Gull Lake? In the fall 2016 survey where we asked residents about proposed garbage and recycling pickup, the beaches area (including Grand Marais and Gull Lake) had the lowest interest in having curbside pickup with at least 45% of respondents saying they were “very uninterested” and “somewhat uninterested”. You can view these survey results here. If, at some point, enough residents in these areas express an interest in curbside pickup, Council would likely consider implementing it. We will not be picking up yard waste or compost. Who is responsible if the waste or recycling carts are lost/damaged or stolen? If carts have a manufacturer’s defect, they are covered under warranty. If the contractor or the RM damage the carts, either the contractor or the RM will be responsible for the replacement. Otherwise, the resident is responsible for lost or stolen carts. The replacement cost will be about $125 and the RM will have surplus carts available for residents to purchase. The carts have RFID (Radio-Frequency Identification) chips in them. Will these be used to track our garbage and recycling? No, the RFID chips will be used to identify the home the cart belongs to. The RFID is connected to the roll number of your property. I have a long driveway and it will be difficult for me to get my carts to the road. Long driveways will be a challenge for some homeowners. We have contacted other RMs that also have homes with long driveways to see how they have handled this. None of them now receive concerns about long driveways and said these concerns fall away after service has been operating a few months. Other RMs also have a special service option available for people who are physically unable to move their carts. In some cases residents store the carts near the end of their driveway and use their vehicles to transport garbage and recycling to the carts. carts. Also, there are hitch attachments available on-line to transport the cart and someone in East St. Paul also came up with one when curbside pickup was implemented there. What do we do if we have more garbage or recycling than the carts can hold? Can we haul it somewhere and if so, is there a fee? If you have more garbage or recycling than the carts can hold you can either wait until the next pickup or take the trash and/or recycling to a transfer station or Libau Landfill. There is no charge to drop off recycling. At the transfer stations there is a charge for garbage of $1.25/bag to take it to the landfill. There is no charge to drop off household garbage at the Libau Landfill. The carts are very large and in other areas that use them, the size is more than adequate for most people. Is curbside pickup going to happen for sure? What is the process for the RM to start curbside pickup? The RM determines the exact area where the service is to be implemented and how many occupied properties are in the area. The RM determines the amount of the fee for each home by dividing the curbside pickup contractor’s charge by the number of homes in the service area. The RM creates a Special Service Plan, which is the framework for what will become a by-law if Council decides to proceed. The RM holds a public hearing to allow residents to voice their support, concerns or objections to the Special Service Plan. All residents in the service area are notified formally by mail with 21 days notice about the public hearing and ads are run in the local newspapers. If there are no objectors or if objections are less than 2/3 of the population of the special service area, the RM may decide to proceed. This means they will create a by-law to adopt the Special Service Plan and then will give it ‘first reading’ in Council. This by-law must go through three readings in Council to become law. After the first reading, anyone who registered their objection with the RM is formally notified by mail that they have the right to voice their objection to the Municipal Board. After first reading, the Special Service Plan for Curbside Waste and Recycling Pickup By-law is sent to the Municipal Board for approval. The Municipal Board reviews the by-law, considers objections and can approve, make conditions, or reject the plan and they may or may not decide to hold another public hearing. All the latest information will be on our website at rmofstclements.com/trash. We will also send out latest news by email. How does St. Clements compare to other municipalities? Municipalities across Manitoba are working to improve their waste management systems and meet new provincial requirements for how waste is managed. The Libau Landfill and transfer stations require major physical upgrades and operational improvements. The price of operating the transfer stations and landfill has increased dramatically due to higher hauling costs and tougher regulations and environmental requirements. But places like Hanover, Portage La Prairie, East St. Paul and Taché are increasing recycling rates and reducing the amount of waste heading to the landfill. With a better approach, these municipalities are providing their residents with curbside garbage and recycling pick-up at similar or lower per-capita costs than St. Clements. St. Clements is falling behind, but together we can do something about it. A new way of doing things will ensure we can meet provincial regulations, protect our environment, and ensure waste management in St. Clements is cost-effective and sustainable. Why is it so important to act? An effective solid waste management system is an important service every growing community needs. While many municipalities have made changes, St. Clements is slowly getting left behind. Our current system does not meet new provincial regulatory requirements, is inefficient, and inadequate for handling certain materials. The reality is, garbage has changed. For more than 50 years, global production and consumption of plastic has been on the rise. From plastic bottles to instant coffee pods, more plastic products are finding their way into our landfill where they take up to 1,000 years to decompose and can leak pollutants into the soil and water. That’s why the Manitoba government is focused on reducing the amount of trash being sent to Manitoba landfills and why St. Clements must take action now. What if I already use a private collector for my garbage? Curbside garbage pickup is convenient and predictable. That’s why many St. Clements residents have opted for private curbside collection. Unfortunately, some private curbside pickup contractors in the RM of St. Clements do not currently pick up recycling, only garbage. For convenience, some people throw their recyclables away with the garbage so it is going directly into the landfill. If the RM of St. Clements implements curbside pickup, households already using private collection will likely realize significant savings. We heard from many residents about the success they’ve had composting at home, and helping to keep organic material out of the landfill – and we were so glad to hear it! Organics breaking down in the landfill cause methane gas, which is 21 times more potent than carbon dioxide for global warming potential. Landfills account for 20% of methane gas emissions in Canada. Several people had suggestions for programs to encourage composting, and it’s certainly something we’d consider in the future.